Since 1938, approximately 8,000 acres of marsh have been lost in Maryland's Blackwater National Wildlife Refuge, (a rate of nearly 130 acres per year). While former ponds and channels still exist below the surface, nearly the entire marsh has been breached and is barely recognizable as it once was. Several factors contributed to the area's severe marsh loss, including wildlife damage (primarily geese and the nutria, an invasive rodent species), a rising sea-level, severely altered hydrology and salinity, and an increase in wave energy associated with greater stretches of open water. While most marshes build upwards through sediment deposition, Blackwater has no source of incoming sediment because the hydraulic structure is degraded, and the sea level continues to rise. Essentially, it is being drowned. To predict further loss of land, a detailed topographic model and light detection and ranging (LIDAR) are being used to develop a digital elevation model (DEM). Running a forecast of sea-level rise, it becomes apparent that without intervention the entire area will be submerged in the next century. Several engineering adjustments, such as channels, dams, housing developments, and new roads have occurred and will continue. An understanding of tidal characteristics will minimize the ecological impact of these changes and will eliminate such problems as further erosion or a rapid change in salinity (salt content) that could harm marsh species. Building on its relationships with the National Aquarium in Baltimore, the U.S. Army Corps of Engineers and the U.S. Fish and Wildlife Service, NOAA's National Ocean Service (NOS) has joined a partnership to help restore the tidal wetlands of Blackwater National Wildlife Refuge. Local and state agencies, as well as U.S. Geological Survey (USGS) are also involved in the project. The Aquarium has constructed a series of three small restoration sites in the marsh. It is conducting precise photo time-lapsed monitoring of restorative plants there, and has installed sediment erosion table (SET) equipment to measure marsh accretion and subsidence. This is the first phase of the restoration project; subsequent phases only will be conducted on a larger scale. Planning for these phases is currently under way. NOS is performing a detailed tide and geodetic study of the system. 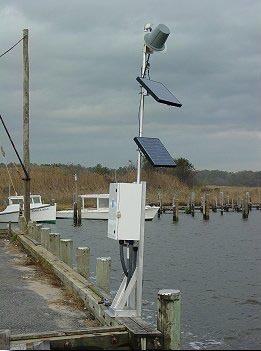 A tide station was established at McCready's Creek in Fishing Bay in November 2003 for at least one year to recover tidal datums and to perform analyses on the frequency and duration of inundation (high waters). Preliminary tidal datums have been calculated and will be recalculated throughout the year. One-year datums will be computed and connected to geodetic datums through GPS and leveling techniques. The analyses will be referenced to marsh elevations and to tidal and geodetic datums. The Corps of Engineers installed five short-term water-level stations throughout the marsh in the fall of 2003. Static GPS connections were made to three of these gauges to monitor vertical stability and to connect tidal datums determined at these stations to geodetic datums and to McCready's Creek datums. NOS's Center for Operational Products and Services conducted thorough tidal analyses of the Corp's data and compiled a report to assist in further planning. Over the next few years, a thorough analysis of the entire basin will be conducted. It will incorporate USGS stream gauges and NOS tide gauges to characterize the area's hydraulic connections and tidal characteristics. These findings, including river runoff patterns, will be relevant to city planning in Dorchester County, MD as well as in the restoration area.